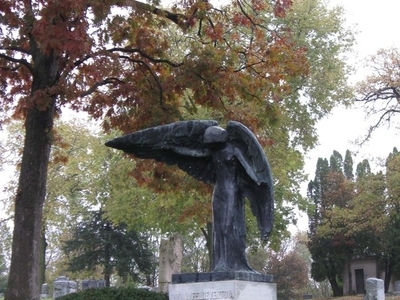 Oakland Cemetery is located on the north side of Iowa City, Iowa, and has served as the main cemetery for Iowa City since 1843.locally famous monument, the 8.5-foot (2.6 m) tall "Black Angel" statue by Mario Korbel was erected in 1913 as a memorial to Nicholas Feldevert. Local lore and superstition surround this beautiful, but eerie, Angel of Death. Many students and surrounding residents of Iowa City visit the statue. The biggest night of attraction is Halloween where students and residents gather around the statue, some test their luck by touching or kissing the statue. It is said that if one touches or kisses the statue they will be struck dead, unless that person is a virgin. Here's the our members favorite photos of "Cemeteries in Iowa City". Upload your photo of Oakland Cemetery!